This climb is better and more sustained than the Center route. 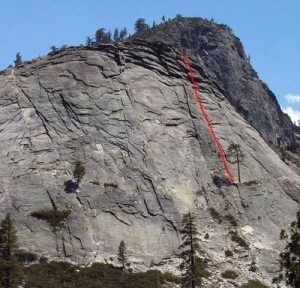 Some of the first 30 feet of dirty climbing can be avoided by climbing on the right face. The pitch then ascends a 150-foot-long right facing corner with fun liebacking, stemming, and the occasional hand jam. If you set the first belay in the first large pod, bring extra 2.5-3.5 cams. If you set the belay 10 feet higher you have more gear options. The awkward one-move 5.7 crux involves throwing your left hip into the wide crack and liebacking the edge with your right hand to get your body into a chimney position. Protect the move with a 4.5” or avoid the crux entirely by face climbing left and joining the center route. A second crux comes 10 feet higher on a 5.6 mantel over a bulge that looks intimidating, but is straightforward. Which SuperTopo guidebooks include a topo for Harvey's Wallbangers, Right?